C.A.T.C.H. has been nominated as a potential recipient of funding from the Aviva Community Fund, but the amount of money they could win depends entirely on the number of votes they receive. Here's how to support the group! The river people are holding a jumble sale this Saturday, 29th April, to raise money to fund the work they're doing to improve the River Cale. Their previous sales have been so successful that for the second year running it'll be held in Wincanton Memorial Hall, the only venue with enough room for all the stuff and things. What better way to celebrate Christmas this year than to pick other people's grimey rubbish out of a cold, wet river? And to top it off, it's totally FREE. 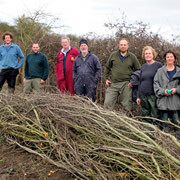 Join us at Carymoor Environmental Trust on 10th December for a free course, giving people a chance to learn the traditional rural skill of hedgelaying to maintain livestock-proof hedges and create a fantastic habitat for wildlife. The C.A.T.C.H. team have organised a public action day for this Sunday, 19th July, for the specific purpose of pulling up Himalayan Balsam, an invasive, non-native plant species that takes over the river bank and damages the ecosystem. On Sunday 19th April 2015, the C.A.T.C.H. team removed a sluice gate in the Hawkers Bridge weir, Wincanton. There are two weirs bookending the Wincanton stretch of the River Cale, preventing fish passing back up through them to reach up-stream. Join the C.A.T.C.H. team and other local organisations on Saturday 25th April to watch (and maybe help!) as a new Memorial Meadow is planted with wild flowers and poppies in what was once overgrown land at Cale Park. Chris Sperring, a professional wildlife conservationist most recognisable these days by his involvement with the BBC's Springwatch, will be in Wincanton on 13th March to give a talk on wildlife conservation in this area. Tickets only £3! Volunteer ‘Butterfly Transect Walker’ Julian Rawlins monitors butterfly numbers on the Carymoor nature reserve near Castle Cary. He reports on his 2014 results, revealing that it was a good summer for butterflies. Community action group C.A.T.C.H. will be carrying out their next litter pick along the River Cale on Sunday 1st March 2015. As always, the group would like to invite any willing volunteers to join them on the day from 9.00am. C.A.T.C.H. aims to repeat the success of its jumble sale held in the Balsam Centre on the same date last year. To help raise money for the work the team does to clean and protect the river Cale, donate your non-electrical stuff! 11am - 2pm, 30p entry, under 12s free. The Environment Agency has seen fit to release a significant stock of bred fish into the River Cale in Wincanton, as a direct result of, and credit to the work C.A.T.C.H. has been doing to clean up the river and improve its status as a bio-diverse habitat. What’s outside the window? 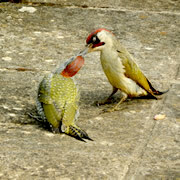 Having always enjoyed watching wildlife, I decided a couple of years ago to start recording what I saw pass through my garden here in Wincanton, and what I saw on our local River Cale. 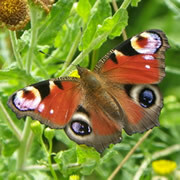 The CATCH team is eager to move forward and create a wild flower meadow as part of the Town Council’s Cale Park project. Ground preparation work must now get going to make sure the land is ready for sowing next year. On Sunday 6th July 2014, C.A.T.C.H. held its first river clean-up of the year, inviting everybody to join in and help clear rubbish out of the Cale. Read on to find out how it went, what was achieved, and to watch the video!